What Do I Do If My White Clothes Turned Gray in Wash? 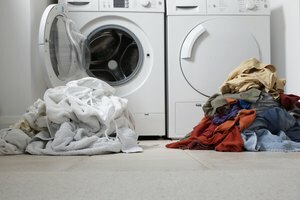 Dry the laundry only after stains are completely removed. You work hard to keep your clothes looking fresh and new, but accidents such as color bleeding happen to the best of us. The surest way to avoid accidental dye stains in the laundry is to separate your whites and colors before adding it to the wash. When accidents do happen, however, don't despair -- stains can be removed with readily available cleaning products. Sort through the laundry and remove the colored article. Put on a pair of rubber gloves to protect your hands from chemical irritants. Apply a heavy-duty liquid laundry detergent directly to the stained portions of the white clothes. Rub the fabric together vigorously or use an old toothbrush to work the detergent into the stain, then rinse the garments with warm water. Repeat the process until the stains begin to fade. Use a bucket to soak the garments in a solution of powdered bleach and warm water. If necessary, use a white towel to weight the garments down so they are fully submerged. Follow the bleach manufacturer's measurement and soak time instructions precisely when creating the solution. Wash the clothes at the hottest temperature that is safe for the fabric with a commercial color remover. If stains remain, repeat step 5. Always read the care label on your garments to determine fabric content and safest laundering methods. Remember to follow the manufacturer's instructions when using a color remover or any other cleaning agent. Henson, Chance. "How to Remove Color From White Clothes Due to Colored Clothes." Synonym, https://classroom.synonym.com/remove-color-white-clothes-due-colored-clothes-11419.html. Accessed 18 April 2019.